What is China's visa waiver program? In general, any person who is not a China citizen is required to have a valid visa in order to enter China. As long as you have a citizenship of another country other than China, you need a visa, even if you are a native Chinese or have Chinese origin. A visa is considered valid when it is not expired and your entries are not used up. If you are under following circumstances, you can have a waiver from applying for a Chinese visa. You take an international flight en route your destination other than China. You're going to stay in China's airport and not exceeding 24 hours. You have a valid air ticket to connect flight with confirmed seating. 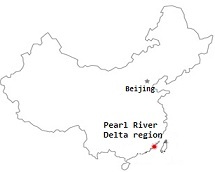 China's Pearl River Delta region is called the Pearl River Delta Economic Zone. With the less restrictive economic policies set by the Central Government of the China In 1979, it quickly transformed from a region that was once largely agricultural to a manufacturing platform and modern service industries of global importance. You join a tourist group at Hong Kong and Macao. The group you joined is organized by a registered travel agency. You are a citizen holding a passport issued by one of the nations with diplomatic relations with China. You won't stay in the Pearl River Delta Region for more than 6 days. If you plan to travel to Hong Kong, check out Hong Kong Visa page here. You may not need to apply for a Chinese visa.